Next month my first article will be published over in Knucklebones magazine. It's a bio on Bruno Faidutti and his games. To celebrate that I'll be publishing a few new articles about Bruno here in Gone Gaming. So, enjoy, and be sure to pick up the November 2006 coverdated Knucklebones when it hits your local game store to read more about "the master of chaos". Based upon the hypothesis that game design is a particularly collaborative type of creativity, this February I posted an article I dubbed Six Degrees of Collaboration wherein I showed the interconnectivity of the game design world based upon who had done full-fledged collaborations with whom. I was quick to discover that the center of my chart was Bruno Faidutti, a French game designer who had done work not with just other French designers, but also Americans, Germans, and Italians. He was the lynchpin that hung the whole world of game design together. Since then I've been occasionally expanding and tweaking my chart, as interest and knowledge strike me. Bruno Faidutti's central role hasn't changed much. His 10 connections on the previous chart have expanded to 11 connections in this chart plus a pseudo-connection. However I've been able to fill in much of the periphery, discovering entire new game companies who connect back to Faidutti. In my initial article I detailed three different types of collaboration: true collaboration, serial collaboration, and developmental collaboration. To those I add a fourth type of collaboration: supplemental collaboration. True Collaboration: A (usually) peer-to-peer type of collaboration. Two designers work together in order to jointly create a game. It can be face-to-face or it can be offline. It's the prime type of collaboration described herein. Developmental Collaboration: A hierarchical type of collaboration. A designer creates a game, then a developer revises it. Typically I don't consider developmental collaboration sufficiently interesting to be listed on this chart (though, make no mistake, it's crucial to the success of most games). However, when developmental collaboration rises to the point where both creators' names are listed on the game box, then it's included herein. This seems to happen most often in American releases, such as Arkham Horror or Runebound. Serial Collaboration: A hierarchical type of collaboration. One creator designs a game, then another creator designs another game using the same core system. Carcassonne and Empire Builder both offer examples of this. Supplemental Collaboration: A hierarchical type of collaboration. One creator designs a game, then another creator designs a supplement for that game. Again, this tends to happen most frequently in American releases with Arkham Horror and Dungeon! both being examples on the chart. We can look at collaborations via another means: the nationality of the designer. Last December I outlined several different schools of game design and differentiated between the national characters of Anglo-American, French, German, and Italian games. 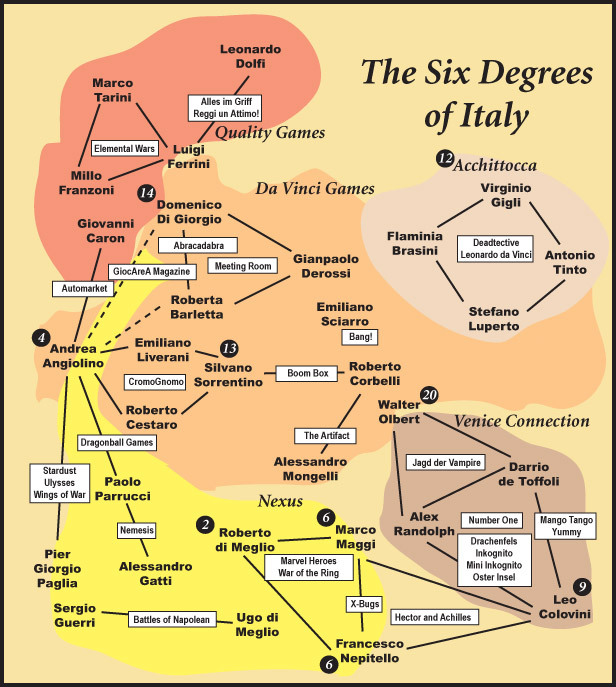 As I've continued to build out my "Six Degrees of Bruno Faidutti" chart, it's become obvious that these national characters influence not just the way that designers make games, but also the way in which they engage in collaboration. Anglo-American Collaboration: Anglo-American engage in collaboration through corporations. We see this through large numbers of American game companies, most prominently TSR, FASA, and SPI. The very similar graphing of Games Workshop shows that this style of working together isn't limited to this side of the pond. These ongoing business relationships make collaborations much more common in the United States, and if Anglo-American games are disproportionately represented in my chart, it's because they also have many more collaborations through their corporate entities. Also notable is how loyal these corporate entities remain. Very few Anglo-American designers seem to engage in collaborations with more than one company. You have a Gary Gygax who moves from Avalon Hill to TSR or a Scott Haring who moves from TSR to Steve Jackson Games, but these are the exceptions (who helpfully provide us with connectivity), not the rules. More often an Anglo-American game designer seems to remain in collaboration with his choosen company until: he leaves the industry, the game company goes out of business, or he strikes out on his own to form a new company. French Collaboration: French collaboration was the basis of my original article, and seems to exist as networked collaboration. Designers collaborate with friends in a very freeform manner, and are perfectly happy to design a few games each with a lot of different people. Granted, this definition is currently based largely on Bruno Faidutti's work, but we see similar patterns with his direct contacts, Ludovic Maublanc, Serge Laget, and Bruno Cathala. Days of Wonder, a French-American company, appears in the chart for the first time in this new edition, and it's remarkable that their pattern of publication seems to match the French networked collaboration model rather than the corporate collaboration model of American companies. Ignoring the public-domain Gang of Four, every Days of Wonder game designer has a Faidutti Factor of 2 or less. With a dozen games under their belt, that can't be a coincidence. German Collaboration: There were comments on my original article asking why the Germans were so poorly represented. Simply: they don't seem to collaborate. More frequently German designers seem to be fierce individualists, or else have one or more co-designers with whom they do lots of work. Italian Collaboration: Though the Italian side of this chart is still pretty sparse, I did do a lot more work this time looking at the Italian landscape of collaborative design. It looks to me like it's geling around a corporate collaborative model much like the United States, but that it's still in a sufficiently early stage that you can't really connect people yet. 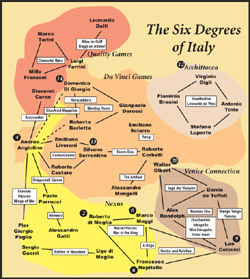 As seen in my recent "Six Degrees of Italy" chart (reprinted to the right; click for a larger view), there are lots of separate designer communities, only one of which connected back to the main chart through Venice's Jagd der Vampire. Oddly, I see more three-person and four-person collaborations in Italy than I found elsewhere (including the newly founded group Acchittocca), and so I'm left wondering if the "design studio" is a unique aspect of Italian collaboration. I think we're really going to see the Italian design community gel in the next five years, if daVinci and other leaders in the market continue to find success. Old American company Chaosium was added thanks to a link that didn't exist six months ago: the first Arkham Horror supplements, designed by Robert Vaughn. This let me link in Arkham Horror itself and from there a number of Chaosium employees. I was actually surprised that the Chaosium folks didn't do more board game collaboration, but then they've primarily been a roleplaying company for the last 25 years. Just for fun, I put myself on this chart too, in the Chaosium section. I've got weak (for board game) connectivity to: Greg Stafford (RPG work), Lynn Willis (RPG work), Kevin Jacklin (RPG work), Charlie Krank (Mythos development), and Richard Launius and Kevin Wilson (Arkham Horror development). 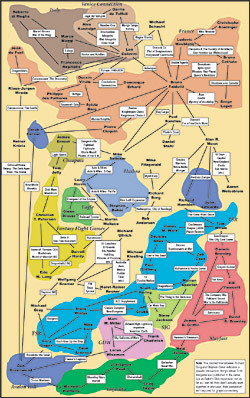 If you want you can draw in all those connections on your copy of the chart; the arrangement of the companies is correct for them. And, that would provide a cross-link from Chaosium down toward Reiner Knizia. The new game Funny Friends was another one that opened up connections to several new designers, here Friedemann Friese's aforementioned friends. The connection is weak, because it goes through the serial borrowing of a single game mechanic, role drafting, but it's an openly acknowledged borrowing, so I've included it on the chart. FASA and Games Workshop both appear on this new chart thanks to a link from Derek Carver that I'd been too lazy to follow-up on in my first iteration of this chart. However I was even more surprised to discover that FASA in turn linked up to Bill Fawcett, who was also already on my original chart. I'd missed his connection because of his alternatively using William and Bill as name in his design work, something else that seems to happen more often in American designs for some reason. In any case, this created a new crosslink on the chart that helps to hold everything together. SPI and West End Games are two more American companies that appear for the first time, all through Steve Winter's supplemental work on Sniper. (You'll note that all of my major new connections are slightly weak, through supplements or mechanic borrowing.) The SPI section is pretty amazing in how it forms an almost perfect wheel around the late Redmond Simonsen. His influence on wargaming design, and thus board game design in general, can't be underestimated, and I think that's clearly and graphically shown by his position at the center of SPI creativity. Given his love of graphic designs, I think he would have approved. With all that said, here's some charts. On the left is the old chart, for comparison purposes, and on the right is the new one. Just click on either to see the full-sized chart. I sure this won't be my last iteration of the Six Degrees. I've still got a couple of old paths that I want to track down, and every month brings new collaborations as well. Me, I'm still waiting for my holy grail: the connection to Klaus Teuber. I think the missing link will ultimately be the Atlantis expansion to Settlers of Catan. I just need to wait for some of Teuber's collaborators there to do more original work of their own. My current money is on Stefan Risthaus as being the one who'll bring Klaus Teuber into the world of Bruno Faidutti. For the Teuber connection, you might also take Das Buch for the connection as there where many people contributing for the scenarii. For example, Horst-Rainer Rösner contributed and did work several times with Wolfgang Kramer among others. You can also find some other popular names in the variant designer, like Fritz Gruber which I think is in charge of the boardgame part of Kosmos. On the previous version, there was talk about Bruno's Bacon number. It's actually 4. Bruno developed Key Largo with me, JK Rowling and I worked together on the Harry Potter Trading Card Game, Gary Oldman was in the adaptation of Rowling's Harry Potter and the Prisoner of Azkaban, and he was with Kevin Bacon in Criminal Law. Aaron Weissblum is trapped in Germany, as someone on BGG pointed out!